Posted October 7, 2015 by Alex Harmon & filed under Chinese, Dessert, Eat & Drink, Taiwanese, Yum Cha. It doesn’t feel like a food court restaurant inside a shopping mall, in fact it doesn’t feel like you’re inside at all. Mrs Mi in Chatswood Chase brings the authentic taste of Northern China’s Shanxi region into what appears to be a bustling and vibrantly coloured street-side location. You may not know the Shanxi province, but you do need to discover their specialty: knife-shaved noodles – made by none other than the robot chef. The Braised Beef with Noodles ($14.80) are the freshest you’ll taste; in fact it’s all fresh – you can see the (human) chefs preparing everything right before your eyes. 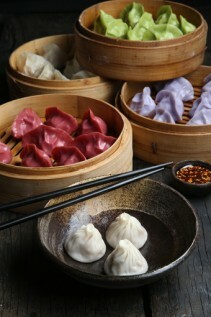 Go for the Handmade Dumplings ($14.80) – it’s best to grab a selection of naturally colourful dumplings (purple sweet potato, beetroot and spinach supply the colours). Cleanse the palate in between with the surprisingly delightful Cherry Tomatoes in Plum Juice ($7.80); then dive into the Taiwan-Style Fried Chicken ($15.80) – the perfect street food. These lightly tempered parcels may not be traditional to the region, but they don’t disappoint either. Neither do the crowd favourite: Pan Fried Pork Buns ($11.80), which ooze sweet, tender pork from inside their delicate casings. End your feast with a Mango Pudding ($7.80) – and unlike the noodle chef, there’s nothing artificial about this flavour.